One might think that during a solar eclipse, with the moon covering a portion of the sun, that earth dwellers might feel a slight drop in temperature as they gaze up safely, of course, with their special eclipse glasses. 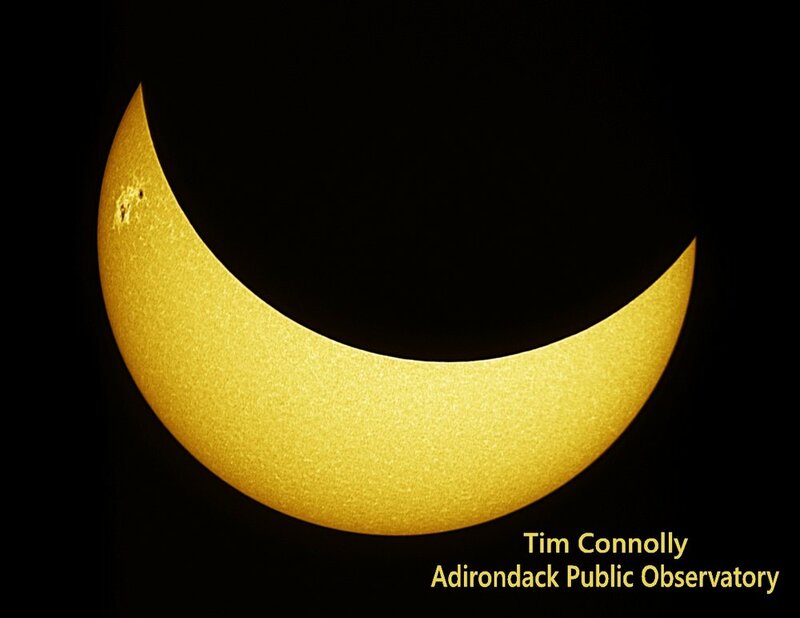 That was not the case, however, as the sun felt hotter than ever at the Adirondack Public Observatory’s (APO) solar eclipse event. Over 150 people flocked to the site overlooking Little Wolf Lake Monday afternoon to marvel at the moon inching past that hot Adirondack sun which started its movement shortly before 1:30 p.m. It would be considered a great success as adults and children alike lined up nearly all the way to Big Wolf Rd. for an opportunity to get an intimate view of the eclipse from the APOs many high-tech, high performance telescopes used specifically for viewing our native star. Others simply laid back on the lawn and viewed the eclipse from afar through their eclipse glasses that were available for sale at the APO. Unfortunately, perhaps not expecting such a great turnout, the APO quickly sold out of eclipse glasses not long after the event’s starting time. Many of the amateur astronomers at the event brought their own eclipse glasses. Others came with homemade pinhole projectors made from cardboard boxes, and some even came with welding masks. Despite the lack of eclipse glasses, many attendees were more than happy to share their safe viewing with others who arrived too late to secure their own pair, which comes as no surprise from a community such as ours.